The recent Romaine lettuce recall and all that holiday feasting may have left you wondering what to do next in the salad department. 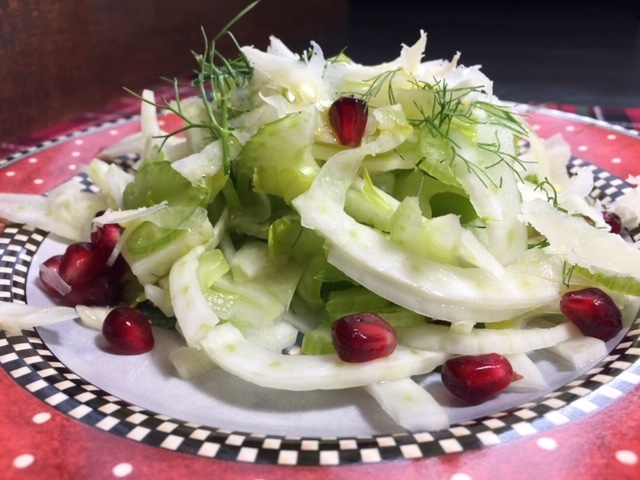 This Fennel and Celery Salad is quick, easy to make, and is also a good way to use up some of that extra celery you may happen to have in that crisper drawer right now. It’s light, bright, refreshing and it’s good for you. Fennel is loaded with vitamin C and fiber and it’s licorice-like flavor can be soothing to digestion, and who couldn’t use a little of that? You can make this salad just as directed below, or you can have some fun with it and add some slices of fresh apple or pear. I tried orange slices, too, and they also worked well. You can toss in some tiny chunks of other varieties of cheese in addition to the pecorino for added interest. I added the pomegranate seeds to make it feel a little merrier, and when I ran out of plain walnuts, I used the spiced nuts out of the nut bowl and it was jingle all the way. 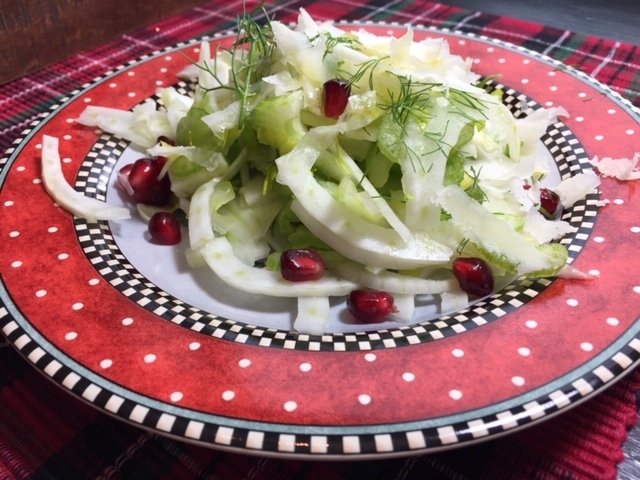 If you have a mandolin it will make slicing the fennel and celery very speedy. Once you get that mandolin out, keep slicing. I prepped extra fennel and celery and kept it in a covered bowl in the fridge, ready to make another salad for the next day. Adding toasted pine nuts or pumpkin seeds, instead of the walnuts, will turn it into something a little different. Next up, a fast, easy sheet pan supper you can pull off even if your to-do list is longer than Santa’s. Mound fennel and celery in the center of a large serving platter. Season with salt and sprinkle with walnuts. Squeeze lemon over all and drizzle with olive oil. Top with shaved pecorino cheese and freshly ground black pepper. Garnish with pomegranate seeds.